Aloha again from paradise. 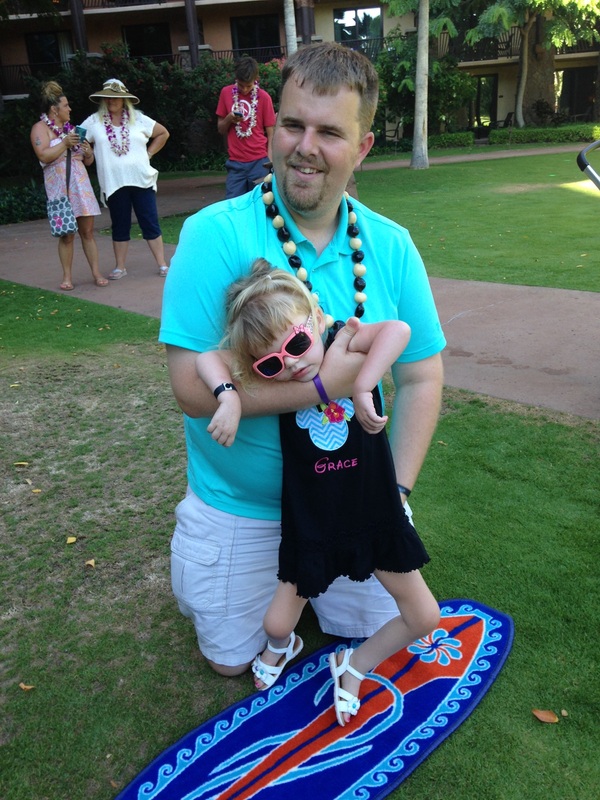 We are still working to acclimate ourselves to Hawaii time. Grace pretty much had no trouble at all. Kyle was up before 6 a.m., and I woke up around 7:15. Those who know us well are probably laughing now trying to believe that's true! 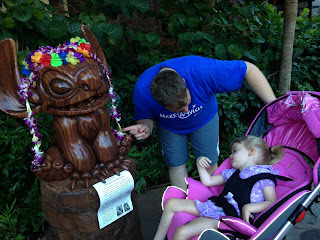 We started out the morning checking out a state of Stitch. We enjoyed some quiet time this morning on the deck of our hotel room, just watching the ocean and taking it all in. Kyle ran downstairs to get us some breakfast, and Grace woke up just in time to enjoy some of the bounty. I'm afraid the healthy eating will just have to wait until we get back home. There's just too many great things to try out here. Since we were all up and going pretty early, we decided to try out the pool this morning, which was a huge hit. All suited up and ready to go swimming! We got all suited up and headed downstairs for another walkthrough of the resort. 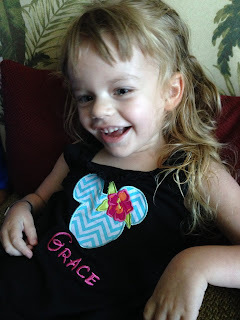 We checked out Aunty's Beach House where she had an activity later in the evening, and also visited the Pau Hana house, where they had a special free gift for Grace, a dolphin necklace, flower hair clip and a Hawaiian bracelet. They also told us they would reserve Grace a special spot up front for their evening show on Thursday night, and that we could come by anytime to cool off from the heat and enjoy activities there. 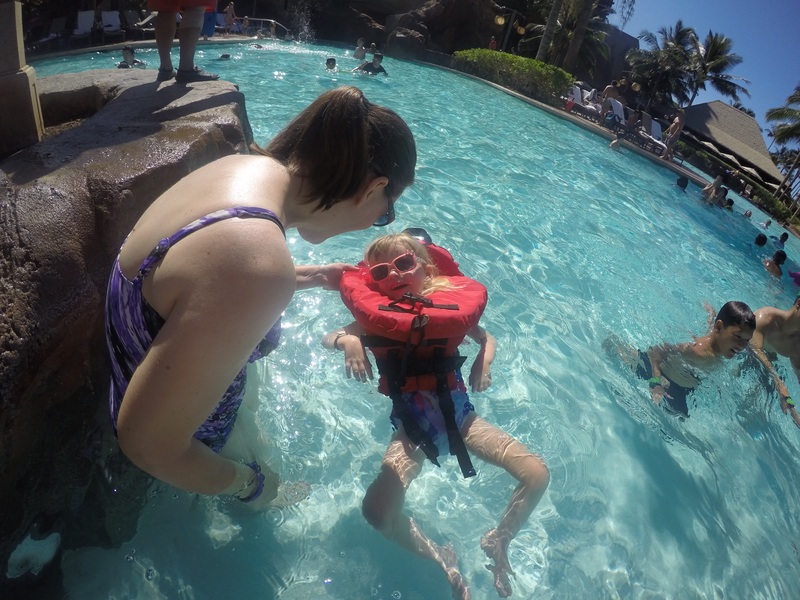 Trying out her new life vest in the pool. She smiled the whole time! Then, we made our way to the pool. You use your room keys to get bracelets and towels for the pool area. 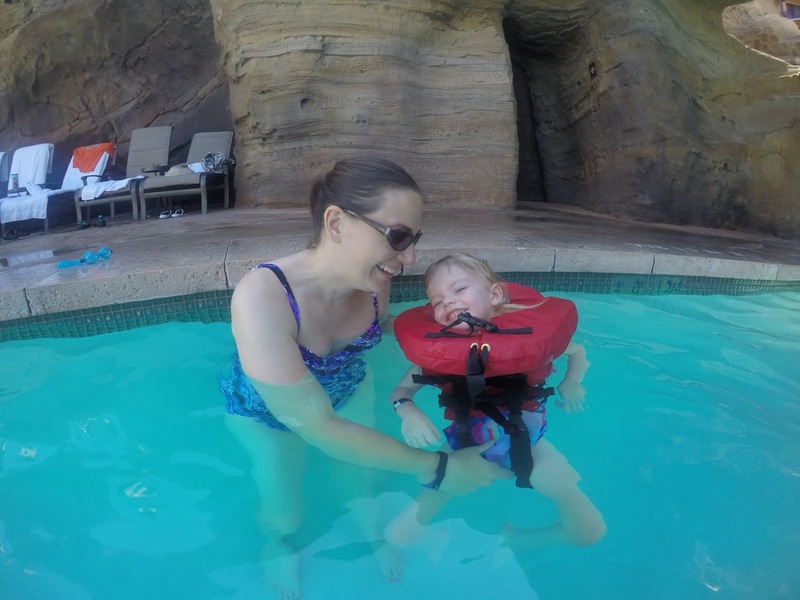 It was the first time Kyle had a chance to see Grace in her new life vest, and she smiled pretty much the whole time we were there. The pool even had some parts in the shade, where we hung out so the sun didn't bother her eyes. She splashed in the water, and just loved to splash Kyle. We even found some shady spots where Grace could really enjoy the water. 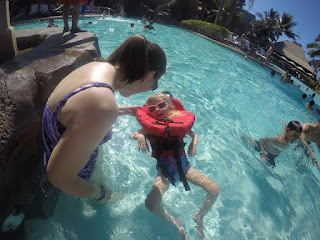 We were trying to decide if one of us could take her down one of the water slides, so we each gave it a go. The slide is completely enclosed and very dark, so after my trek down, we decided it probably wouldn't work to take her down. But as I came up sputtering, Kyle was giggling, so I suggested he give it a go. He did and even made a GoPro video going down. It's pretty hard to see since it's so dark in the slide. 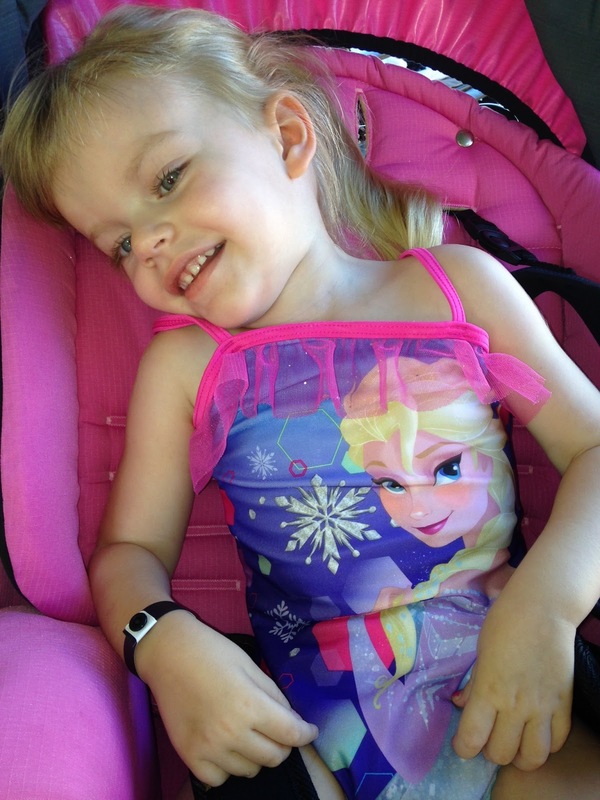 However, we did get a darling video of Grace swimming in the pool. All smiles in her darling dress that Aunt Mikaela had made for the trip! After about an hour and a half or so, Grace decided she was done swimming, so we headed back to our room. Grace and I headed out to get some sandwiches and yogurt for lunch. She's really been enjoying yogurt parfaits on this trip. 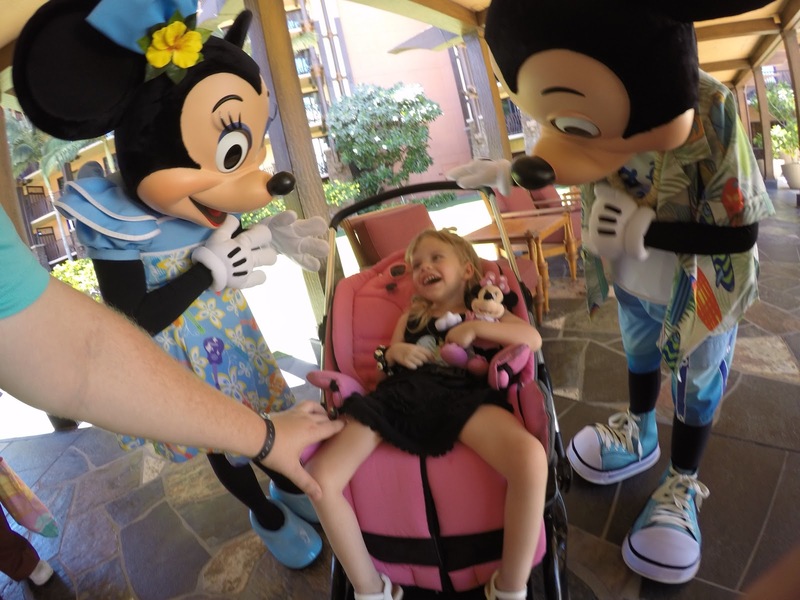 This is Grace seeing Mickey and Minnie for the very first time. Then, it was time for what is sure to be one of the highlights of the whole week. 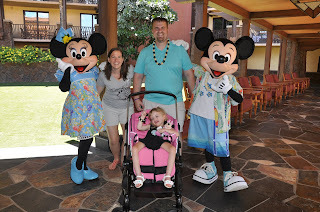 We got Grace dressed in a special Hawaiian Minnie Mouse dress that Aunt Mikaela had made for her. We put on her necklace, bracelet, and even a flower in her hair. 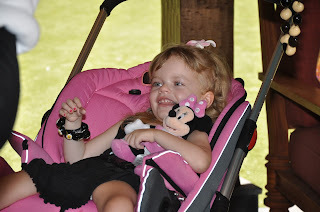 She had to look her best to meet Mickey and Minnie! Seeing Grace smile like this was one of the highlights of our trip! 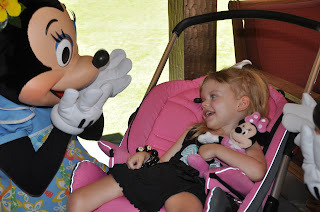 The resort set up an exclusive "meet and greet" just for Grace with her very favorite characters. And it was amazing. 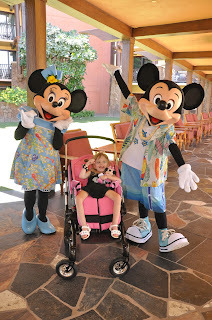 Cheesing with Mickey and Minnie! We met them in a courtyard, just us and a photographer, who provided a CD with nearly 100 photos from the 15-minute meet and greet. Grace just LOVED when Minnie played peek-a-boo with her! 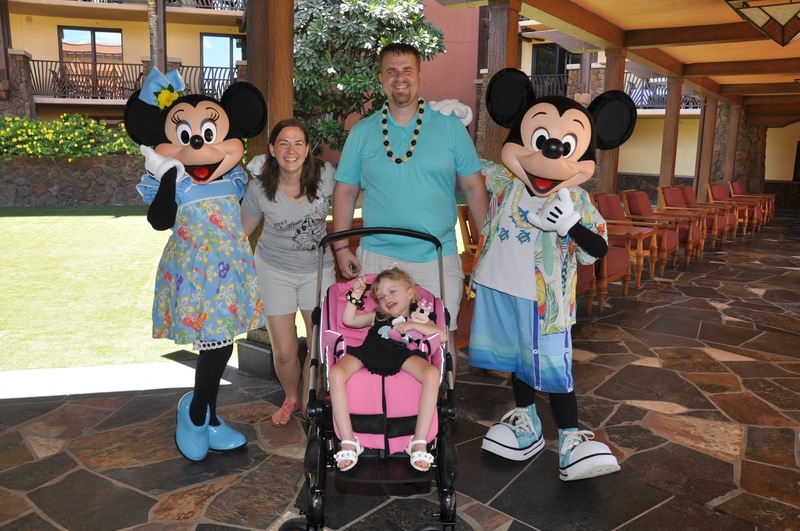 As Mickey and Minnie, dressed in their Hawaiian finest, approached, the smile on Grace's face was something I will never forget. They posed for photos with her, smiled at her, and even played peek-a-boo with her, which is her very favorite game. Watching them take the time to really interact with her on her level, got a bit emotional for me and Kyle. Just watching her smile and "talk" in her own way to them is something I will remember as long as I live. They made sure Grace knew she was the most important person they visited that day, and even though she couldn't tell them she loved them or thank them for their time, I know they knew how grateful she was, just from her bright smile. I still get a little teary eyed just thinking about what a special time it was. Even mom and dad got in on the fun! To celebrate, we stopped at the gift shop, and Grace got her very own stuffed Hawaiian Minnie to take home with us, and it hasn't left her side since. We tried to lay down and take a nap, but Grace just decided there was too much to see and do to sleep. So, instead, we joined daddy, who was sitting on the deck listening to Jason Isbell, and just relaxed and enjoyed the view. As Kyle was looking through some of the programs for today, he saw a surf party with Disney friends, so we thought we would try it before Grace's party tonight. They had a bunch of brightly colored surfboard shaped rugs on the lawn, and the leader was teaching kids some surfing terminology. It was really cute, and Chip and Dale even showed up before we left for some dancing. Grace really seemed to like it. Grace trying out some surfing moves with her dad. 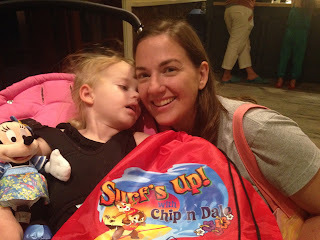 Our final activity for today was Chip and Dale's surf party at Aunty's Beach House, which is a kids-only place. They allowed one parent to help Grace, so I went to join the fun. We ended up meeting another Make-A-Wish family, and really enjoyed that. Grace enjoyed the dinner of pizza and macaroni and cheese, which are two of her favorites, plus chocolate for dessert. Mommy and her tired girl after the Chip and Dale party. She also liked the music and watching the kids dance with Chip and Dale, but without a nap this afternoon, she got pretty tired before the end of the program. I stood up to hold her, and she immediately started waving bye, which was a good sign it was time to go back to the room. But the Disney staff packed her a bag so she could decorate her surfboard back in our room. Daddy relaxing at dinner, while Grace and I were at the party. 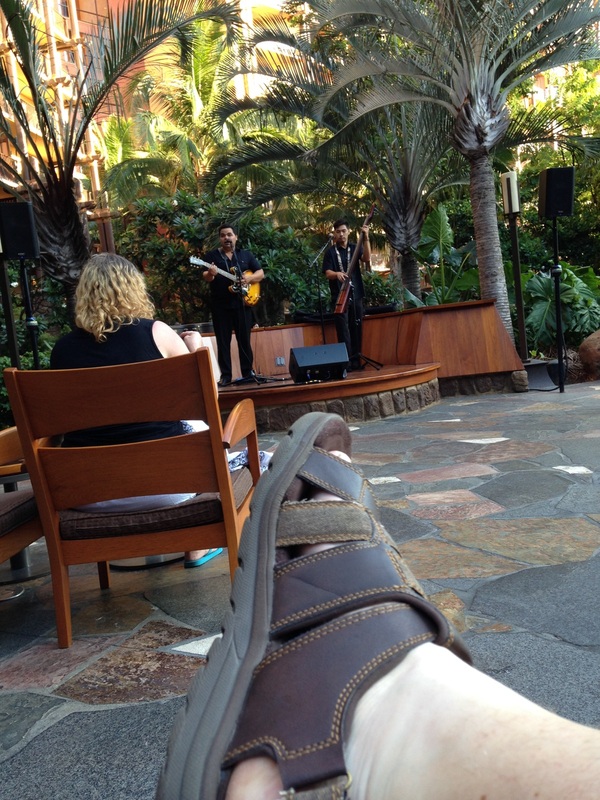 While we were partying, Kyle enjoyed ahi tacos for dinner and sat in an outdoor cafe enjoying the live music. He met us when we were ready to leave and we got some ice cream in the gift shop before coming back to the room. Grace was too tired to even eat any, which means you know she was tired. So, she's fast asleep, awaiting her chance to meet a dolphin tomorrow. Yup, just another day in paradise. Oh my goodness! This is so amazing and I'm only on day 2!